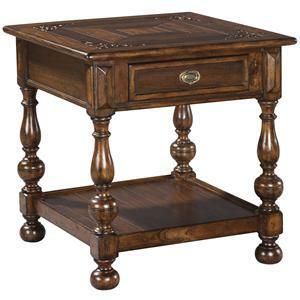 Place this traditionally designed sofa table in a hallway or living room for a beautiful home accent. 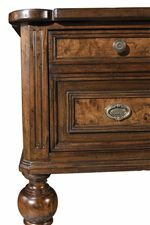 Crafted in solid walnut and mahogany with thick ball-turned legs, this piece is sure to become a family heirloom through the years. Two storage drawers adorned with antique-colored handles can organize home accessories for easy access. 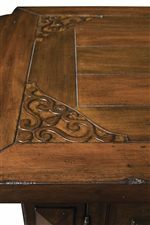 Display artwork or room decor on the spacious, planked mahogany veneer surface outfitted with decorative corner inlays. 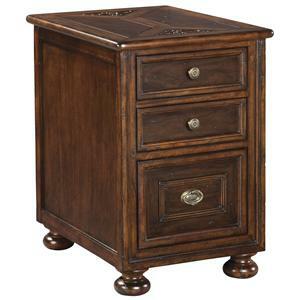 Finished with a weathered look, this traditional sofa table will instantly bring a warm, rich atmosphere to your home. 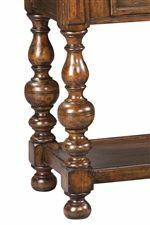 The Villa Valencia Traditional Walnut & Mahogany 2-Drawer Sofa Table by Hekman at Hudson's Furniture in the Tampa, St Petersburg, Orlando, Ormond Beach & Sarasota Florida area. Product availability may vary. Contact us for the most current availability on this product. Description: Top Planked veneer top with decorative inlay detail in each corner. Add intrigue and a sense of traditional style to your living room with the Villa Valencia occasional table and desk collection. Composed of beautiful mahogany and walnut solids with mahogany veneers, the deep rich color is finished for an elegant, vintage look. 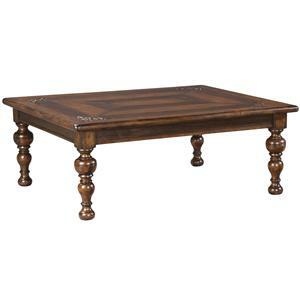 Each table features turned ball legs for a traditional feel, while planked veneer tops with decorative inlay details at each corner adds to the overall design and visual appeal of each table. Simply a beautiful collection to accent any classy home, the Villa Valencia collection will have you feeling like royalty. 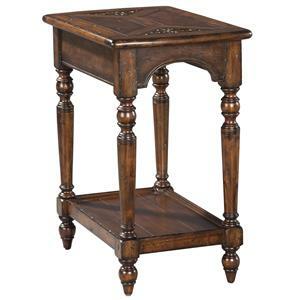 The Villa Valencia collection is a great option if you are looking for Traditional furniture in the Tampa, St Petersburg, Orlando, Ormond Beach & Sarasota Florida area. Browse other items in the Villa Valencia collection from Hudson's Furniture in the Tampa, St Petersburg, Orlando, Ormond Beach & Sarasota Florida area.